Ocicat Cat breed information and advice. Ocicat cat breed information and advice. Ocicats are a domestic breed that have been selectively bred to have the exotic looks of a wild cat. Imitating the natural beauty of larger felines such as the ocelot, the leopard and the jaguar, the Ocicat breed of cat has an affectionate disposition. The first Ocicat appeared in the USA in 1964 when an Abyssinian cat was bred with a Siamese cat. These kittens were bred to another Siamese and one of the kittens had golden spots on a white background. His resemblance to the ocelot, a wild cat found in South America, was commented on and the name Ocicat was born. The breed was established in the UK in the 1980s and granted full GCCF championship status in 2005. Life is never dull with an Ocicat - they are highly intelligent as well as being loving and affectionate, and will want to be with you constantly. Often referred to as a 'dog in a cat's body', Ocicats can be trained to play fetch and often come when you call them. Ocicats have sleek, shorthaired coats which come in 12 different colours - tawny, chocolate, cinnamon, blue, lilac and fawn, and also silver patterns in black, chocolate, cinnamon, blue, lilac and fawn. The Ocicat Classic has a marbled pattern. They have almond-shaped eyes that are either green, amber, yellow or gold. Ocicats are fairly low maintenance when it comes to grooming; a weekly brush and ear clean will suffice. 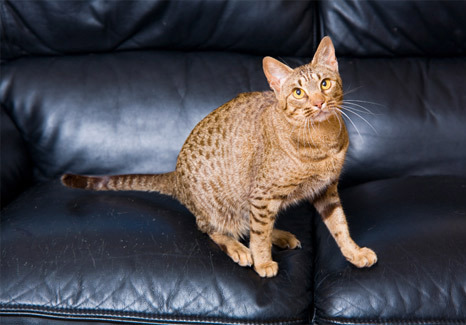 A generally healthy breed, some inherited diseases such as Hypertrophic cardiomyopathy (HCM) have cropped up in UK Ocicats in the past, but breeders are working to eradicate them, while the Ocicat Registration Policy also tests for diseases known to occur in Abyssinians. As there are only a small number of Ocicat breeders in the UK, you may have to wait a while for a kitten and be prepared to travel. Ocicats are people-orientated cats so if you will be out at work all day, it's kindest to have two for company. Bear in mind too that Ocicats are quite lively and inquisitive and like to climb and jump, so be prepared to keep them entertained.